I was sent the wrong size acrylic. I was asked to send pictures of all original packaging, and measure the large acrylic. They had cut it wrong. I ordered this on October 23rd. I let them know of the problem the day after I received it. Retrieving all plastic, and cardboard packaging. My emails went ignored, even though they state it will be answered in 1 business day. It is now Nov. 13th. I am just receiving acknowledgement of a DAMAGED ACRYLIC? they didn't even bother to read the problem? Still waiting for the replacement. This should have been a one week process. I am extremely disappointed. This is a measurement THEY assess, for their frame?! Would not recommend their service. Hello Krista. We sincerely apologize for the inconvenience. This is a very rare service breakdown that we do not expect to occur in the future. We have rushed you the correct sized acrylic and put for our best effort to make this right with you. We certainly do not want to lose your business and we hope to show you our true, top notch quality. If you have any questions or need anything, please do not hesitate to reach out. We can be reached at 1-800-332-8884. Thank you. Ordered 3 sets of this frame and they came unassembled. The directions were easy to understand and the frame was easy to put together; make sure that the corners connect properly or they can be a little sharp. I wanted something simple and easy to let the stitchery project show and not highlight the frame and this frame does just that. I really love the three frames I purchased. They were easy to put together. The white metal frame was well constructed and set off the picture beautifully. Needed an inexpensive, white metal frame. Found it here. It arrived quickly and was easy to put together. 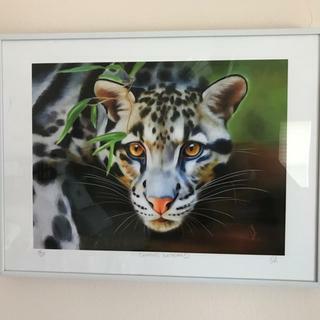 I had bought an unusual size print and could not find a frame -- standard frames didn't come in that size and custom frames were ridiculously expensive. Was glad to come across this site in my search. The frame was a great bargain and it looks like it cost a lot more. It took me a little while to figure out how to put it together but it's one of those things where once you've done it, you realize how simple it is. My advice is to not assume you know what you're doing -- actually read and follow the directions. I didn't like the hanger provided, used command strips instead. Very easy to assemble. I’m happy with how they look. This frame does exactly what I needed. Great! I needed inexpensive frames to show my work and these are perfect. I didn't want frames that would distract. 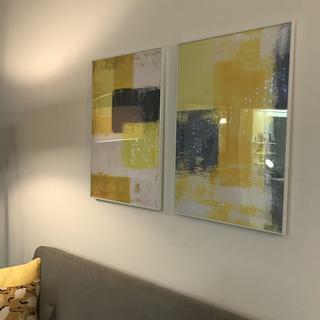 These just hang there quietly, beautifully displaying my work. I ordered 10 more. Plus very easy to put together! Ordered an 11x72.5" frame. Instructions were fairly easy to follow. Frame delivered in good shape. There were a few small spots where the paint was scuffed, but nothing too significant. Overall fair quality for the price. Hello Emma! Thank you so much for your feedback! We are thrilled to know that you are pleased with the order you received. Even if the imperfections are very small, we want to make it right with you. In the future, please give us a call if the frame is not in perfect condition. If you need anything, please do not hesitate to give me a call directly. I can be reached at 1-800-332-8884. Happy Framing! Great frame with an easy price! Pictureframes.com is my go to frame supplier. Never been disappointed, and this frame is no exception. Perfect! Great quality, clean, and simple frame. Perfect for a modern touch to a home! This is a great product. I would definitely recommend it. The frame was easy to assemble and it looks great once put together. Very clean and modern vibe. I love it! In the past I used a nice white metal frame that I loved. I saw this one that happened to be on sale and gave it a try. The savings was considerable because I bought 4 frames and I am pleased with the less expensive frame that was on sale for this use. They were easy to assemble and look nice on the wall. I had this poster for years. I moved it twice, but did not get it framed until I found your very cost-effective frame online. Now it is framed and looks great! Exactly as described. Worked perfectly for what I needed. Very reasonably priced. Cut to the exact size I asked for. The frame arrived faster than I expected. It assembled easily with very clear instructions. The framed piece was exactly what I had wanted. I do not have a photo as it was a gift. Easy to assemble. Nice frame and works well with a bright small pastel. Worked out well. Perfect! Easy instructions with everything I needed to produce a very professional result at a fraction of the cost. I couldn't be happier and will be returning for future framing needs. simple lines, excellent quality, good value. I use these frames for all the photos on my photo wall. It looked great for the large puzzle I had mounted on a black background. It made this special puzzle stand out. Easy to put together and would certainly recommend it to anyone. Thanks for the great service! Loved this put together frame. veery easy to do! looks great. As always, this white metal frame is perfect for my entire art collection. I love the clean lines and simplicity of this frame. The experience of ordering the frames and the timely manner we received was excellent the only problem we had was when we put them together the corners did not match, it left a gap showing from the front even thought it looked perfect from the inside so we had to do some rigging to make them work. Hello Barbara! Thank you for your comments! We love to hear that our Customers experienced excellence. We work had to make the ordering process an easy as possible. In the future, please give us a call if you have any issues with assembling of the frame. We have instructional videos that we can email you that will give you the guidance you need. Thank you again for letting us know about your experience. Your feedback is very valuable. Have a awesome day. Happy Framing! For the price they are what I expected. Understand that you do have to put them together. Not difficult, but something you should know in advance. I used them on pictures for my own enjoyment and they are fine for that use. I wouldn't use them on images I was going to sell or give to others. In those cases, I would spend the extra money for a better quality frame. For me they fit the bill for what I wanted them for and I would purchase them again if needed. Quality is okay. Since my order didn’t cone with a backing I’m not able to use it. Hi Mina. Thank you for your review. Our customer care team has reached out via email to let you know how to order the backing. When placing your order, you do have the option to add a finish kit, which includes the acrylic front and a foam core backing. If you do not select one of these options, the frame will arrive as frame only. We do this to ensure that we never send you something that you do not need. Our care team is available Monday-Friday 8am-7pm eastern time and can be reached at 1-800-332-8884. We appreciate your business and looking forward to hearing from you! I have ordered metal frames from this company for years now and have always been happy with their product. However the last two orders have been so dirty, lots of an oily graphite type material all over the surface and when I opened one paper wrapped section at least a teaspoon of metal filings/shavings fell out onto my table top and floor. Had to get the dogs out of the room and break out the vacuum. Never had to do that with previous orders. Hello Carol. Thank you for your review. We regret to hear that this frame did not meet your expectations. This is certainly not the experience we wish to leave with you. We have passed your feedback along so that we can improve your future experience. If there is anything else we can do for you, please let us know. We appreciate your business and look forward to serving you better in the future! easy to put together and very professional looking. unfortunately came with a few blemished on the steel. Hi Mikael. Thank you for your review. We regret to hear the frame arrived this way. We can certainly get a replacement set up for you. Please give our customer care team a call if you would like to move forward with the replacement. They are available Monday-Friday 8am-7pm eastern time and can be reached at 1-800-332-8884. We appreciate your business and look forward to making it right for you! Frames would have been fine if they came with all parts needed for framing. Frames were good but one of the frames was lacking a v groove part to connect the sides. Thus, I could not frame my art work properly. Thank you for alerting us to this issue. I am so sorry to hear you were missing hardware. We are more than happy to replace this for you. We will set up an order for replacement hardware for you. I was shipped a black frame instead of white. It was a gift so due to time constraints I was forced to keep the black one. Very disappointing!!! Hello Michael. Thank you for considering us for your framing needs. We regret to hear that you experienced this rare service breakdown. In these unfortunate situations, we typically take care of the issue by issuing a free replacement frame. We sincerely did not want to cause any disappointments. We understand this was a gift and we want to make this right with you. As a courtesy, we are issuing a company credit that will automatically apply to your next purchase. If you have anymore concerns, please give us a call at 1-800-332-8884. Thank you for your business. Hello Antonio. Thank you for taking time to speak with me today. We apologize for any inconvenience. We have documented your comments and we will share them with our Production Team. This seems to be a rare service breakdown that we want to rectify. As a courtesy, we have placed a complimentary discount on your account. Thank you for your business. Have a great day! Cheap looking metal frame (not wood) with cheap acrylic (not glass). Very disappointing. Hello Jennifer. Thank you for your honest feedback. We have the frame listed as Metal (M) in the description to make sure our Customers are aware of the frame's material. Instead of offering glass with the frames, we offer Clear Acrylic which is shatter proof and light weight. We have emailed you a UPS return label so that you may return the order. Once the order is received back here at our facility, we will offer you a full refund. We apologize that the order did not meet your needs, and we appreciate you taking time to give us your review. Have a great day! Hard to find the dimensions I was looking for at the Ikea near me. Price is good. have 4 5x15 series of photos - wanted simple white frame. I was looking for a low profile white frame. For a clean look to be used for framing a watercolor. My daughter has an inexpensive photo made. The size is a custom order & many places wanted an outrageous price to frame it. Should it not get framed it would of gotten ruined & defeated the purpose of getting it. You offered a reasonable amount to frame it & I was happy with the costs. Thank You, you save a photo wit your framing costs. The Artwork that I made needed a white frame. Also, these frames (I usually order the black ones) do not detract from the artwork itself. I like the simple and clean look of this frame for the items I am framing. It looks good for my artwork. I like metal frames. Great price. The reviews were very positive. Modern, simple frame. Makes photos look great. I wanted a simple frame that would allow the framed piece stand out with minimal distraction. Modern and simple for art that is the same. I wanted something minimal and clean. I WANTED AN INEXPENSIVE BUT NICE LOOKING FRAME FOR MY GRANDSON'S TEAM PHOTO. Economical option for a photo; will set off the black and white photo well. Have been happy with my black metal frames in the past. I love the simplicity of the profile and they are easy to put together. Good quality items, have other frames that are great and the ordering and processing through the site is easy. I have ordered several similar frames with black finish. Completely satisfied. Want white for black/white photograph. I have a hard time finding very narrow, simple frames with a less than one-inch depth. This looks exactly like what I have been looking for. Fingers crossed. Classic, simple styling that emphasizes the art and goes with any decor. 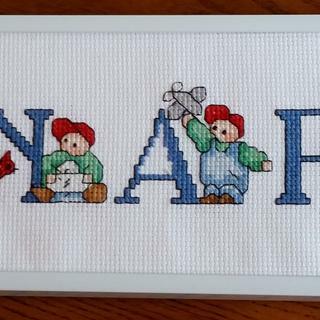 These frames are easy to assemble and show off my stitching in just the right sizes. I'm a loyal customer who has often done business with you. You are my go to for frames! 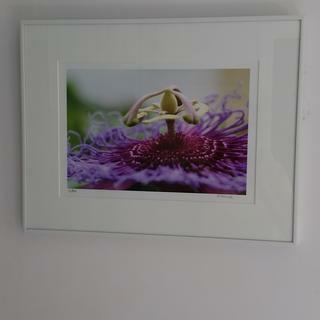 I am framing nature photos, and I wanted simple frames that would not detract from the subject matter. Easy frame for Dallas Cowboys mural. The close up image shows a clean square edge and the whole frame image shows a molded edge. I prefer the clean square edge. Which is it? BEST ANSWER: Hi Thank you for asking. These narrow metal frames do have a slightly curved profile. 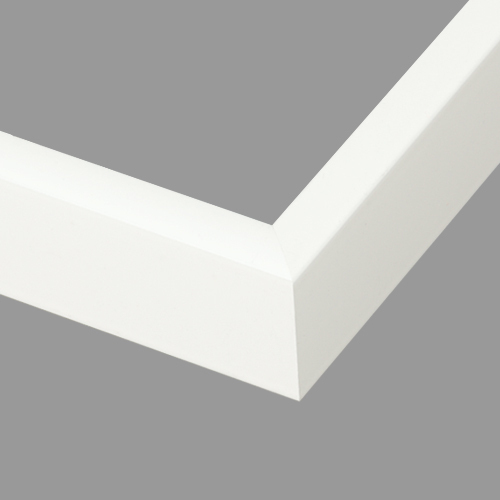 For a more clean square profile we would recommend that 710WHT or 711WHT. You can view them at the links provided here. https://www.pictureframes.com/Metal-Frames/Modern-Metal-Poster-Frames/711WHT-brushed-white-modern-metal-frame and https://www.pictureframes.com/Metal-Frames/Modern-Metal-Poster-Frames/710WHT-brushed-white-modern-metal-frame . We hope that this is helpful! I see what you mean if you saw the picture of multiple frames on the left. However, the 111 line is flat; the 222 line is slightly rounded (as shown in picture of multiple frames). The corners of the frame (where he pieces join) is a clean square edge. However the front-facing edge of the frame has a slight molding to it. It is a clean square edge. It is the molded edge. I need a rabbet depth of 3/4 to 1 " for a stretched canvas. How do I request that on an order? BEST ANSWER: Julia please start at our home page. Then scroll to the bottom of the page and click on canvas frames. You can then modify the search on the left hand side of the page to show you frame/rabbet depth. We have the depth of each frame listed as the rabbet. Please make sure the frame you are interested in has a rabbet of 3/4"-1". After looking over the questions am I correct to assume that you add a 1/8" 'tolerance' to the frame size? I am framing map (no mat) and I don't want the frame to cover the edges. Sorry. I used a mat so didn’t have this problem. Just my opinion but it seems to me that 1/8” shouldn’t really make a big difference. Good luck. I would imagine you would need a "floating" frame if you did not any of your substrate/image to be obscured by the frame. When I put in the photo image size it says the "outside frame size" is exactly the same. 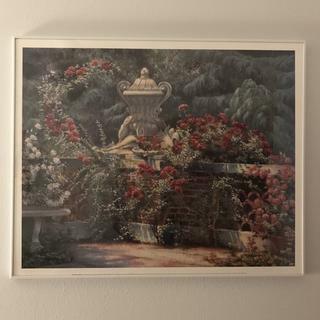 I was looking at a plain white frame - no matting - but even so, shouldn't the outside frame dimensions be a little larger? You’re right, one would expect the outside frame dimensions to be slightly larger. 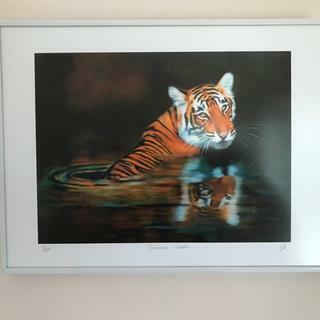 But I think the reason it’s not is because in order for your picture to be completely covered by the frame, the inside dimensions of the frame need to be slightly smaller than the picture. Since this frame is very thin, you end up getting outside frame dimensions that are more or less equal to your picture. Does that make sense? Just below where you enter your print dimensions, it auto-updates the “approximate” outter dimensions. In actuality, your frame will likely be just a little bigger than your print but not by much. Your print will come close to touching (or may actually touch) the inside of the frame all the way around. Remember, there will be just a little bit of your print on each edge covered by the frame. Hi Lauri. The outside frame sizes given by our website are approximate. 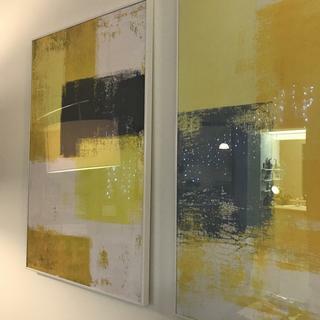 You are correct in that they will be slightly larger to accommodate your artwork and the width of the frame on each side. Please let us know how we can help further! I used our white frame for a mirror. I ordered the exact same size so the mirror would not fall out. If you order a frame bigger than the picture you will have the same problem. I hope that helps answer your question. How much weight would be added if I include acrylic cover and backing for a 40 x 80 oil painting? BEST ANSWER: I am not sure exactly how much that would add. 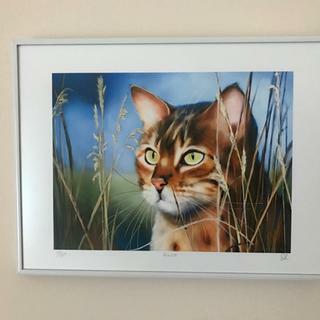 I am thinking it is too much for this metal frame and we also do not recommend putting acrylic over oil as it can stick and damage the painting. The largest framing I have done with the acrylic cover and backing has been 24x30. It added very little weight which made shipping my work much less expensive. Do frames come with the glass ? BEST ANSWER: Our frames give the option of purchasing a an acrylic front and foamcore backing kit separate from the frame, however, they are not automatically included. Thank you! 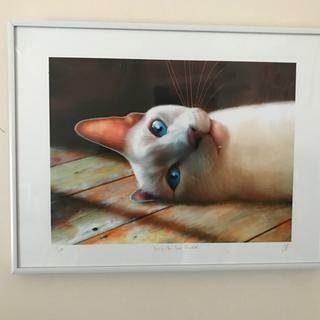 I have a oil painting that measures 30" w x 40" h. Do I need to order a frame a little larger? Thank you for your inquiry. You should order the frame based on the size of your artwork. This particular frame has a rabbet of 3/8" meaning that any artwork thicker than that size will not fit. Is your oil painting on a stretched canvas? If so, you should look for a frame that accommodates a larger depth. 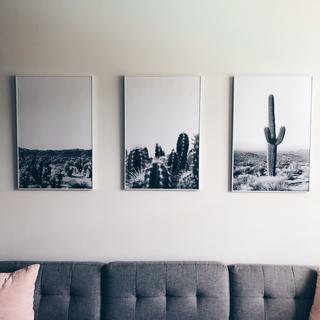 Check out this page for white canvas friendly frames: https://www.pictureframes.com/White-Picture-Frames?c=canvas-friendly. If you have any additional questions do not hesitate to contact our framing experts at 1-800-332-8884. Let me know what size should I get? BEST ANSWER: Hello Rica! Please enter the artwork size exactly. We cut by the 1/8" and add an tolerance of 1/8". If you need further assistance, please let us know. Happy Framing! 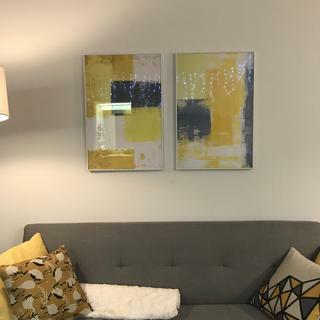 If the picture is exactly 20x30 what size frame is best? BEST ANSWER: Hello Sharon. The frame size should be the same size as the picture. Please order size 20"x30". Thank you for your inquiry! what is the depth of the frame? BEST ANSWER: Hello Sheila! The depth of the frame is 3/8". Please let us know if you need further assistance. Does the frame (with no add ons) include the plexiglass? BEST ANSWER: Thank you for your inquiry. Unless otherwise noted, the frames do NOT come with acrylic (plexiglass) or backing. Please add the acrylic and backing of your choice to the order. Thanks for considering us for your framing needs! I just want a frame for a 12x16 picture that stores don't have and are too expensive online. Are these ok for that? BEST ANSWER: Hello. Thank you so much for your inquiry. This beautiful frame is very economical and popular. The most common use for the frame are framing posters. Let us know if you have anymore questions. Thanks! does this frame have a glass? BEST ANSWER: Hello! Thank you so much for reaching out to us! We don’t sell glass for frames, we sell picture-frame quality acrylic which is plexiglass. Glazing and backing kits are not included automatically because not all artwork or customers need them for framing. Canvas paintings, for example, would be damaged by glazing of any kind. These are offered as separate add-on items during the ordering process which can be added after a frame size is selected. If you require glazing and backing kits to complete frames, you can order acrylic and foam core backing on our website in the Frame Shop, or by placing a phone order with any of our Advisors, any time from 8 pm – 7 pm EST Monday thru Friday. Please let us know if we can help further. Can you cut the frame precisely 1/16 over the full dimensions of mat and glazing? And can you ship with simple acrylic but with NO backing board? BEST ANSWER: Greg, we cut our frames by 1/8". You will need to call us to place the order over the phone for acrylic without backing. is the 2nd column on sizing the rabbet depth? if not, what is the rabbet depth of this frame? BEST ANSWER: The rabbet depth of this frame is 3/8". The second column for the sizing is if you have a 1/4, 1/2, 3/4" etc.